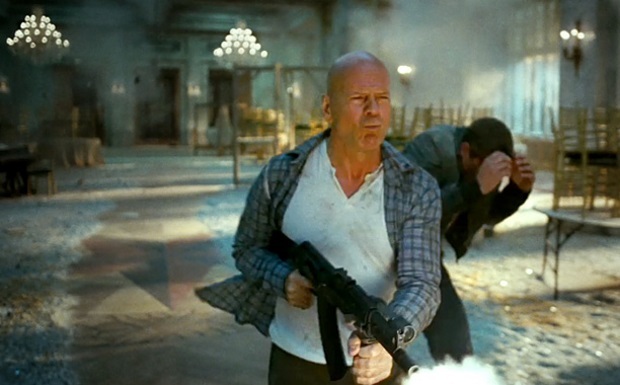 Bruce Willis is making the press rounds to promote his Death Wish reboot, a film that may have you wishing for the actor's Die Hard heyday. Well, those days are never coming back; you know this is you suffered through A Good Day to Die Hard, but the long-developing Die Hard 6 is apparently still happening. Or at least Willis is going to check and make sure that it is. "I’m about to wing out to California to start to see what the script looks like. So yeah, I think so, yeah." How promising does that sound? The film has been in the works for years with Len Wiseman attached to direct. The story looks to be both a prequel and a sequel, possibly based on the Die Hard Year One graphic novel, which takes place mostly in the 1970s as we follow a young John McClane in becoming "a Die Hard kinda guy." Ugh. The other part of the story would take place in the present as McClane investigates a case tied to his rookie year, which would give Willis something to do to earn his paycheck.